J J Abram’s Cloverfield franchise has always wielded an element of surprise as part of its arsenal. The first film, a compelling ‘found-footage’ creature feature, directed by Matt Reeves, was sneak-released to cinemas in 2008, and was, in this reviewer’s opinion, a low budget masterpiece. Its 2016 successor, 10 Cloverfield Lane was a tense, claustrophobic thriller that initially appeared to have nothing whatever in common with its predecessor; until, that is, you reached the film’s final third and everything went completely (and satisfyingly) berserk. And now, here’s The Cloverfield Paradox, directed by Julius Onah and somehow released direct to Netflix with hardly anyone (including the cast!) aware that this was going to happen. As a means of grabbing attention, it works a treat – but there have already been many voices on social media branding the new release as a complete dud – and news that a fourth instalment, with a Second World War setting, is already in the can have led many to believe that Abrams has, quite literally, lost the plot. The opening of Paradox certainly grabs the attention, playing like a lost episode of Black Mirror. It’s the year 2028, the earth’s energy supplies are rapidly dwindling and the world teeters on the brink of nuclear war. Ava Hamilton (Gugu Mbatha Raw) is poised to leave her partner, Kiel (David Oyelowo) to go on a mission into outer space. She and the rest of her crew intend to use ‘The Shepard’ – a particle accelerator – to provide the earth with an artificial power supply – but they are warned from the very beginning that in so doing, they risk inadvertently opening portals that will allow alternative realities into existence. Well, they can’t say they weren’t warned. And that’s pretty much it. The film cuts back and forth between its two locations throughout. It’s nicely shot and for the most part, it galumphs along engagingly enough, even though it soon becomes apparent that this is not so much a Cloverfield film as something else that has been slyly retrofitted to slot into that cinematic universe. Indeed, apart from a couple of subtle visual references, you’ll have to wait until the film’s closing moments to make any real connection with those illustrious predecessors. Perhaps unsurprisingly, in an age where film fans are more polarised than ever before, some viewers have excoriated Paradox, blasting levels of vitriol in its general direction that seem somewhat excessive. It really isn’t that bad – just a bit mediocre and nowhere near as good as its progenitors. And of course, the convenient thing about Netflix is, if you don’t like what you’re watching, you can always reach for the ‘off’ switch. Once in a while a film comes along that is so original, it almost defies definition. This Polish-UK collaboration, is one such film. Billed as the first ‘fully-painted’ feature, it represents ten years’ work by more than one hundred artists. Shot conventionally at first, with a cast of distinguished actors, all chosen for their similarities to characters in Van Gogh’s art, each frame (and there are 165,000 of them) has then been painstakingly overpainted with oils. The result is that the screen seems to writhe and flicker with vibrant colours, the technique plunging the viewer headlong into the artist’s idiosyncratic world. At first, the effect is dazzling, almost overpowering, but once you settle into it, you begin to take notice of the story, which is presented rather like a detective mystery. Did the famous artist really commit suicide? Was he murdered? Or was he the victim of a childish prank gone wrong? There’s no doubting the care and attention to detail that filmmakers Dorieta Kobiela and Hugh Welchman have lavished on Loving Vincent – and it’s amazing to note, that no matter how manipulated the film images are, the actors are always identifiable as themselves, even whilst looking exactly like their portrait counterparts. Jerome Flynn who plays Doctor Gachet is a particularly good example of this. The scene where we first meet him is like watching a famous painting come to life. I particularly like the regular monochrome flashbacks, where a more photorealistic technique is employed, which offers a welcome break from the barrage of multi-coloured visual fireworks. Lovers of Van Gogh’s work will have an absolute field day here spotting all the references to his most famous paintings (there are 120 of them) and though the various theories surrounding the artist’s death are nothing new in themselves, it’s interesting to have them presented for consideration in this way. It’s good too that we are left to make up our own minds about which particular theory to believe. Does this work as a movie? Yes, I think so, but it certainly won’t appeal to everyone. If you don’t care for the artist’s work, this certainly isn’t going to float your boat. Loving Vincent has a limited release across the UK and may end up finding its biggest audiences on the small screen, but if you do get the chance to see it in a movie theatre, then go and immerse yourself in Vincent’s world. It really is quite an experience. Based on the popular novel by Ransom Riggs, Miss Peregrine’s Home For Peculiar Children is a Tim Burton film, that doesn’t feature his usual cohort of friends/family and is largely set in North Wales. Jake (Asa Butterfield) is unusually close to his secretive Grandfather, Abe (a scenery-chewing Terence Stamp) who often regales him with stories about a children’s home he spent time in during the Second World War. Like most Burton movies, this is often very nice to look at (he started off as an illustrator and that always shows) but there’s something curiously unengaging about the film, which is packed full of over-complicated incident, yet rarely manages to exert any kind of grip on the attention. It seems to go on for an inordinately long time, before it finally reaches a climax in an exotic location (Blackpool) where screenwriter Jane Goldman has to find something useful for every one of those peculiar kids to do. Despite all the monsters rampaging across the screen, there’s no real sense of threat here and it isn’t very enlightened to have the one black actor in the film cast as a child-murdering villain. There are admittedly a few nice moments dotted about (a spirited tribute to the ‘fighting skeletons’ sequence from Ray Harryhausen’s Jason and the Argonauts being one of them) but ultimately this isn’t Burton’s finest moment. For a film that’s so packed with fantasy elements, MPHFPC is long on exposition and woefully short of magic. Lance Armstrong was the consummate all-American hero. He famously overcame testicular cancer and went on to win the Tour De France seven times in a row. Along the way, he founded a cancer charity, became a spokesman for the underdog, inspired people to excel and made millions from sponsorship and endorsements. It was all based upon a lie. He was using performance enhancing drugs to achieve his spectacular results and when the truth finally came out, his glorious career lay in tatters. All this, of course, is well known. Now here’s Stephen Frears biopic, which dramatises the story. What it is, is a stripped-down, turbo-charged version of the events, but it’s light on truth and even lighter on detail. We first meet Armstrong (Ben Foster) when he’s in his 20s, when he realises pretty quickly that he’s never going to become a winner in his chosen sport, unless he joins in with the practise of doping, something that most of his competitors seem to be well versed in. He makes friends with journalist David Walsh (Chris O Dowd) who is initially a fan; but when Armstrong starts to easily win races that he’s previously failed at, alarm bells start to go off in Walsh’s head. The problem is, why do his fellow journalists fail to detect something fishy going on? Soon, Armstrong and Walsh are bitter enemies. The main reason to see The Program is to relish Ben Fosters’ extraordinary performance in the title role. His depiction of an obsessive man consumed with hubris is quite extraordinary and the fact that he physically resembles Armstrong is just the icing on the cake. But back to the film’s shortcomings. For us to fully appreciate Armstong’s fall from grace, it would be necessary to learn more about his private life. But this is simply airbrushed over. A five year marriage to Kristen Richard is reduced to a single scene of them walking down the aisle together. There’s no sign of the three children they had. Likewise, his year long engagement to musician Sheryl Crow. The only mention of her is that the two of them are ‘friends’. And finally, his relationship with longterm girlfriend Anna Hanson, (who he’s still with) isn’t even mentioned, let alone the two kids they had together. Stephen Frears is a veteran director, so I can’t believe he’s simply chosen to skip over such important details. Could it be that certain people didn’t want to be involved? At any rate, The Program is perfectly watchable, but it feels suspiciously like the edited highlights of a movie – the full impact of his disgrace fails to come across, largely because we don’t see the repercussions it has on those who loved him. 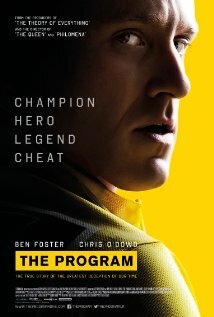 So, in a strange way, the film is as much of a cheat as Armstrong himself. Don’t get me wrong. It’s perfectly enjoyable fare. But you’re left with the conviction that it could so easily have been something much more than that.